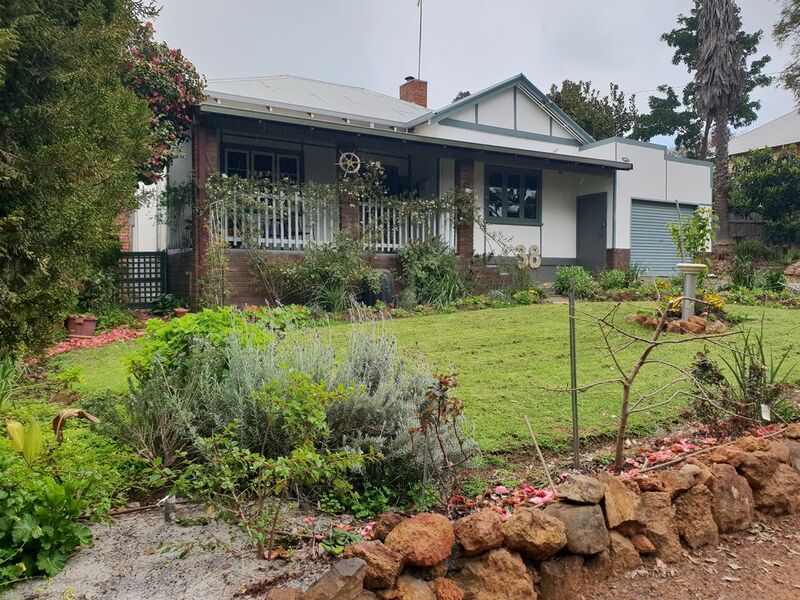 Positioned above the town site with pleasant views over the Blackwood Valley and Bridgetown, Walnut Cottage is set amongst vegie gardens, a walnut & fruit trees - everything you would expect in a country retreat! The home has a lounge room, dining room, spacious kitchen, large covered outdoor entertaining area, laundry and the bathroom features a deep bath with shower and even a ceiling heater for winter! In the library, there are books to read and board/card games. TV for those who want to watch the footy! The two master bedrooms have built in robes and queen size beds - one featuring a local craftsman’s work. Great views from ALL the windows - you would never believe you were in the centre of Bridgetown! The home has been furnished with the utmost care to make your visit here a home from home with high quality furnishings, linen & kitchenware. All amenities are provided: linen, towels, microwave, stove, large fridge in the kitchen and one on the veranda for the drinks! Cooking you would expect to make your stay comfortable.....TV in the lounge room; DVDs, games, stereo (with ipod dock), hair dryer. Laundry features include front loading washing machine, clothes dryer an iron and ironing board. Balingup Medieval Festival in August. A spectacle not to be missed! You will need to bring its drinking/food bowls, leash and bedding. The property is not completely fenced! There are plenty of parks and ovals, so plenty of room for dogs to explore. We have chickens (in a chicken coop) at walnut cottage so if your dog is "featherbrained" this may not be the best option for your stay in Bridgetown. Please check the link www.stayz.com.au/134488 and let me know by email if you would also like to book Ocean View Villa (subject to availability). Please note that a 15% discount applies if booking this property in conjunction with your stay at Walnut Cottage. Great spot - we enjoyed drinks on the verandah at the front of the house and under the walnut tree out the back. Comfy beds, everything you needed in the kitchen and as Xmas day was hot the air conditioner in the living room worked well. The "girls" in the chook pen were good company too. Look forward to staying in Spring. Thanks Alison. I'm just not sure that a pet stay accomodation should have chickens though! My poor dog was driven mad by trying to get to them and I can imagine other dogs being the same. Also, there was no enclosed fence around the property. Again, not so great for a dog pet stay. Other than that - all good. Chickens are an integral part of Walnut Cottage and the country experience our guests enjoy. Responsible pet owners are welcome. Stayed for a couple of nights, with dogs. Great place to hang out and relax. nicely decorated and everything is there for you. Would recommend! Charming old style cottage, great location, lovely gardens, felt like home away from home.